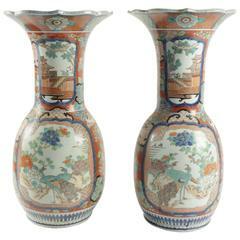 An impressive pair of late 19th century Japanese Imari vases, each with the classical orange and blue coloring. Exotic flowers, blossom and birds set in hand painted panels, motifs and symbols. This pair of vases can be converted to lamps within a week if needs be. 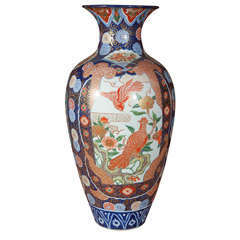 Large and very fine Japanese Imari vase with bird and floral motif. Pair of Imari porcelain vases. Open top, enameled polychrome decor with birds, flowers and Japanese decoration. Japan, 19th century. 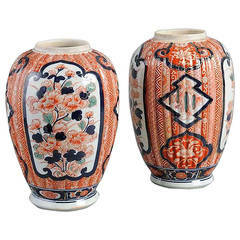 A pair of Imari vases, the ribbed bodies decorated in the traditional manner with blue, red and green glazes, articulated with floral cartouches.